Leading authorities on preservation recommend using glazing that blocks at least 97% UV light. * Tru Vue conservation grade glazing products surpass this standard in providing up to 99% UV protection, the maximum level of protection available in the industry. What factors cause damage to art, photographs and other personal keepsakes? 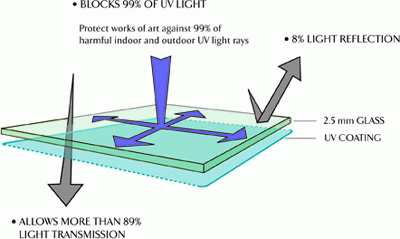 Indoor and outdoor UV light rays contribute to irreversible damage. Colors may fade and shift and the materials that make up the piece may become brittle or yellow. UV protection reduces fading and other damage caused by UV light over time. All light, not just UV light can be damaging. Heat, pollution, moisture, the materials that make up the piece, as well as poor quality framing materials, are all contributing factors. How can you help your customers protect their framed pieces? Help your customers preserve their framed pieces by selecting materials that meet conservation framing standards. Educate your customers on the factors that cause damage. Recommend displaying their framed pieces in a well controlled lighting environment. Does not degrade or delaminate over time. Tru Vue uses a proprietary inorganic, silica-based UV blocking coating, which is “baked” into the glass substrate producing a permanently bonded coating. Glass should be handled with care. To avoid injury cotton gloves should be worn. Avoid dragging the lites of glass against one another when removing from the box. Do not slide the lite of glass into place. Lift it up to adjust reposition. Place a slip sheet or a non-slip matboard between the glass and the back of the wall cutter. Do not score the UV coated side. The inkjet printing stating “this side faces artwork” indicates the UV coated side. Place the lite of glass in the wall unit with UV coated side toward the wall, facing the slip sheet or matboard. Keep the glass cutter clean of glass chips by brushing away fragments frequently with a horse hair brush. Place the glass on a clean, non-abrasive surface for cleaning.